And these were all the consequence of a decade of misguided economic policies — a decade of stagnant wages, a decade of declining incomes, a decade of spiraling deficits. I want to focus on that last phrase: a decade of spiraling deficits. The best way to compare deficits over time is as a share of the economy. 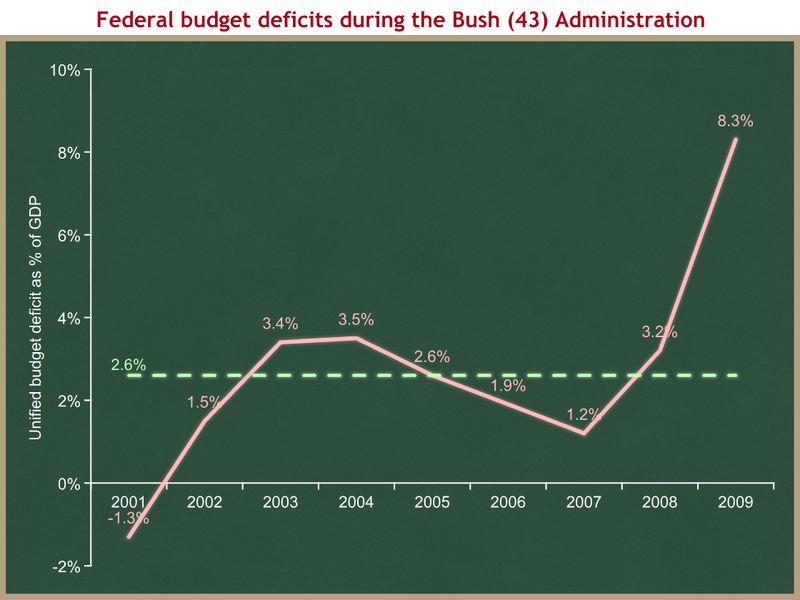 This first graph shows budget deficits during President Bush’s tenure. On this graph deficits are positive, so up is bad. The dotted green line shows the average deficit since 1970 for comparison (2.6% of GDP). As always you can click on the graph for a larger version. This graph does not show “a decade of spiraling deficits.” It instead shows eight years of deficits averaging 2.0 percent of GDP, followed by a horrible ninth year as the markets collapsed and the economy plunged into recession. (Budget wonks who want to understand why I think we should look at nine years for a Presidency rather than eight can read this .) Even 2008’s bigger deficit than 2007 can be mostly explained by a revenue decline as the economy slipped into recession pre-crash. 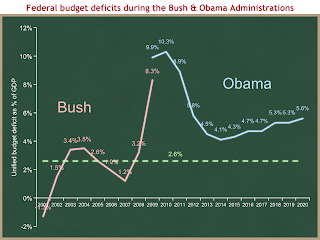 Before the crash of late 2008 President Bush’s budget deficits were 0.6 percentage points smaller than the historic average. 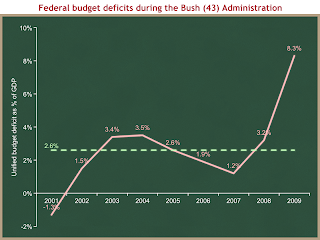 Deficits did not “spiral” during the Bush presidency or the decade. They bumped around the historic average, then spiked up in the last year. One could argue that the last year was a result of policies built up during the prior seven years, but that’s a different argument about financial sector policies. Instead the President and his allies are claiming that the President’s policies resulted in “a decade of spiraling deficits.” That is obviously false. Now let us look at the decade we are now beginning. The blue line shows CBO’s estimate of projected budget deficits if President Obama’s latest budget is enacted as proposed. Numbers are once again from CBO . Which exactly is the decade of spiraling deficits? The last one, or the one we’re beginning now? If you’re disturbed by looking at nine budget years for an eight year Presidency, I wrote this  to explain why I think it makes sense. This graph shows a sharp projected decline as we recover from the crash/recession followed by a steady upward climb. If President Obama’s budget is enacted as proposed, his smallest budget deficit will be bigger than the largest pre-crash Bush deficit. Let’s look at it another way. Let’s focus only on a hypothetical second term for President Obama, when the effects of the 2008 crash and 2009 recession are far behind us. A second Obama term would span five budget years: FY 2013 through FY 2017. CBO says the budget deficit would average 4.5% in that second term. That’s almost two percentage points above the historic average, 1.8 points above the Bush full-term average including the crash year, and one point higher than the highest pre-crash Bush deficit. The steady deficit climb under the Obama budget that begins in 2014 looks like it fits the description “spiraling deficits” for at least the last seven years of this decade. 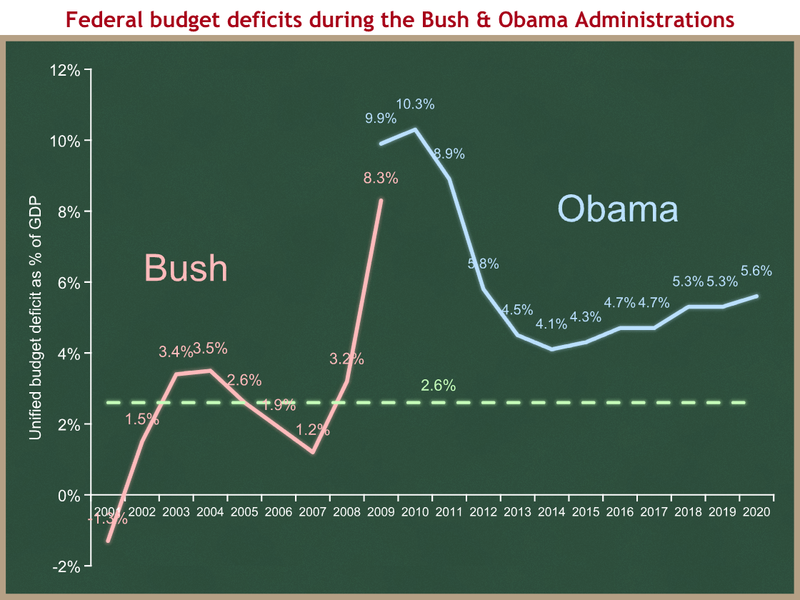 President Obama is incorrect when he labels the last decade as one of “spiraling deficits.” The Bush presidency was characterized by eight years of deficits with no long-term upward trend and which averaged significantly less than the historic average, followed by a financial crash and a year of severe recession and a consequently large deficit. If the President is right when he says that “a decade of spiraling deficits” are “the consequence of a decade of misguided economic policies,” he is looking at the wrong decade. I don’t see how he can justify his own budget.